Jan. 27, 2018: Yiyan Luo helps Rajpreet Atwal during a math pop-up event at the Ontario Institute for Studies in Education in Toronto. Classroom time spent on math varies widely at training programs across Canada. More below: Could you pass the math quiz that student teachers have to take at U of T? Try the quiz at the end of this article. For four years now, an Ontario teachers’ college has administered a Grade 6- and 7-level math test to new students during orientation week, one that includes converting a percentage into a fraction and multiplying a decimal number by a whole number. About one-third of teacher candidates scored at or below 70 per cent, the provincial standard. A Globe and Mail analysis has found the amount of classroom time elementary student teachers spend on math in university training programs across Ontario and the country varies from as few as 36 hours to more than 100 hours. Further, the focus in teacher education programs primarily involves learning how to teach the subject, with less time spent relearning math concepts. This fall, student teachers at the University of Toronto will learn fractions, percentages and other basic arithmetic in a new 24-hour mandatory course on top of another 54 hours focusing on math pedagogy and research. At Nipissing University in North Bay, primary-school teacher candidates will spend 36 hours learning how to teach math, while student teachers at the University of Ottawa will spend more than 100 hours on courses that teach concepts, but focus mostly on integrating math with other subjects. The disparities in training are significant amid growing concern around math knowledge among Canadian students, dropping test scores and the search for where the fault lies. 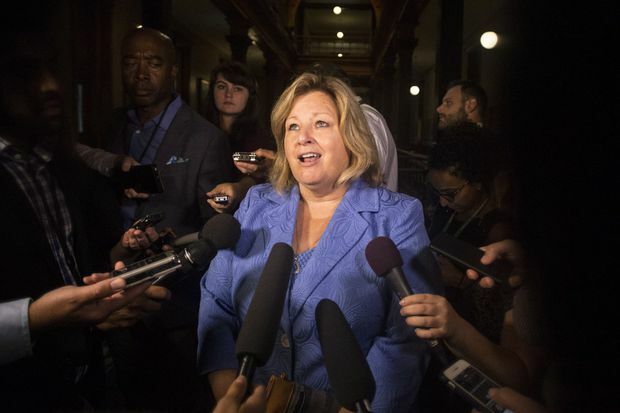 Premier Doug Ford’s government in Ontario, where half of the province’s Grade 6 students failed to meet provincial standards on an annual math test in 2017, is taking stock of the issue. The Ministry of Education recently sent a survey to institutions, a copy of which was obtained by The Globe, asking about the math training teachers receive and the number of hours they spend studying the subject before entering a classroom. In an e-mail to the education community in July, Education Minister Lisa Thompson wrote that the Progressive Conservative government is looking to make math mandatory in teachers' college programs – a statement that caused some confusion, because the subject is already part of the training program at teachers' colleges. There is speculation that this is related to standardizing the training, rather than introducing it. Lisa Thompson, Ontario's Education Minister. Faltering math scores continue to be a concern nationally. Some parents and mathematicians have blamed provincial curriculums they say fail to teach children the basics and instead encourage problem-solving and expressing ideas in a variety of ways. Alberta is looking at a curriculum overhaul that, among other things, would have children memorize more of their multiplication tables earlier. And the new Ontario government has indicated that it wants to return to teaching students the fundamentals. But experts and politicians are also zeroing in on teachers’ math skills, and the time they spend on the subject during their training – not just how to teach it, but on relearning basic concepts such as fractions and decimals. One province where students have consistently done well is Quebec, and experts believe that is mostly attributable to its intensive four-year training program at teachers' colleges – as opposed to one- or two-year programs elsewhere – and teacher candidates spending more hours on math. Concordia University's downtown Montreal campus. Teacher candidates take up to 146 hours of instruction in how to teach math. At Concordia University in Montreal, elementary-school teacher candidates take three courses that focus on school mathematics, such as geometry and fractions, how children learn math and how to teach math, for a total of 146 hours of instruction. Helena Osana, a professor at the university and a research chair in mathematical cognition and instruction, said the number of courses went from two to three about six years ago after a discussion with the provincial government about how prepared graduates were to teach math and science. Dr. Osana said she is concerned about how prepared teachers are nationally, because there are no common standards from one province to the next, despite the scores revealing to provincial governments how students are faring. “Even within one province, I know Quebec for sure, there is not one consistent vision of how to prepare teachers,” she said. The Globe survey found that in many Ontario universities, student teachers spend anywhere from 36 hours to 72 hours on math. Memorial University in Newfoundland provides 60 hours of math instruction to its teacher candidates. The University of British Columbia requires elementary- and middle-school teacher candidates to enroll in a 39-hour prerequisite math course and a 26-hour methodology course. Mary Reid, an assistant professor at the University of Toronto’s Ontario Institute for Studies in Education (OISE), said the issue is that many programs offer math pedagogy courses, which are based on theory and how children learn, but fail to refresh basic concepts. She said this sparked the idea of giving the test to the teacher candidates. Tutors offer help at the OISE math pop-up. OISE assistant professor Mary Reid created a new standalone math-content course that students will be required to take to graduate. But Mark Ramsankar, president of the Canadian Teachers’ Federation, said to blame teachers' math skills or to focus on a test rather than what is happening day in and day out in-classroom, does not paint a full picture. He said Canada’s education system is highly regarded internationally and teachers participate in professional development to improve their teaching. “To simply try to quantify a system based on a singular test really flies in the face of the year-long work that a student and teacher does," he said. And while many agree that scores don’t tell the full story, they also say dismissing them entirely is disingenuous. “A myriad of explanations exist as to why some kids don’t do well in math. But the research is showing pretty consistently that the major predictor for students’ difficulties in mathematics is the lack of quality instruction and opportunity to learn,” Dr. Osana said. Lakehead administers a written math-competency exam – no calculators – on numeracy basics, including fractions and volume, to teacher candidates. About one in three fail and must take a course to understand the concepts. They can take the test three more times, but must pass it to graduate. Dr. Lawson said that as the curriculum has changed to teach children problem-solving, the weaknesses among teacher candidates who do not understand the mathematics become more complicated in front of a classroom. “[The graduates] have to have the content knowledge. They have to. You can’t teach something that you don’t understand,” she said. Chrystal Smith’s “lost years” in math were in Grades 10 and 11, a time when she struggled with algebraic concepts. She is more confident in the subject now, but admits being a bit anxious. Ms. Smith, who is doing her masters in teaching at OISE, joined classmates for an informal tutorial session on a Saturday morning earlier this year, organized by Dr. Reid, during which they were guided on math content by a mix of finance and business students, one of whom was pursuing a PhD. Ms. Smith said the falling scores among Canadian students are perplexing. “I don’t want to blame teachers, because I’m a teacher myself. But I find, in my experience, if I don’t truly understand something, the student is not going to come out with a full and complete understanding of that,” she said. “So I came for help." Chrystal Smith, right, is offered help from Adiba Islam during OISE's math pop-up event. Quiz: Are you smarter than an Ontario teacher in training? At the University of Toronto’s Ontario Institute for Studies in Education, researchers have administered a Grade 6- and 7-level math test to incoming primary-junior and junior-intermediate teacher candidates during orientation week. They found that about one-third of teacher candidates scored at or below 70 per cent, but showed slight improvement after a year in the teacher- education program. In the quiz below, you can try some of the questions from the test. When you answer each question, you’ll see how teachers' performances improved after their year in the program. Answer:27.69. On this question, teachers scored 37.09% before teacher training, and 57.62% one year later, an improvement of 20.53 percentage points. Answer:1 3/8. On this question, teachers scored 60.26% before teacher training, and 80.13% one year later, an improvement of 19.87 percentage points. Answer:1 67/100. On this question, teachers scored 58.94% before teacher training, and 78.15% one year later, an improvement of 19.21 percentage points. Answer:257.05. On this question, teachers scored 33.77% before teacher training, and 51.66% one year later, an improvement of 17.89 percentage points. Answer:309 R-2. On this question, teachers scored 54.3% before teacher training, and 70.2% one year later, an improvement of 15.9 percentage points. Answer:155 R-7. On this question, teachers scored 63.58% before teacher training, and 77.48% one year later, an improvement of 13.9 percentage points. Answer:124.095. On this question, teachers scored 59.6% before teacher training, and 66.23% one year later, an improvement of 6.63 percentage points. Answer:60.5. On this question, teachers scored 62.91% before teacher training, and 65.56% one year later, an improvement of 2.65 percentage points. Answer:15. On this question, teachers scored 55.63% before teacher training, and 56.95% one year later, an improvement of 1.32 percentage points. Answer:180 pages. On this question, teachers scored 55.63% before teacher training, and 47.68% one year later, or 7.95 percentage points worse. How do your math smarts rate? Not so good. Want to try again?